Line drying your clothes can save you a nice little bit of money on your electric bill. It also reduces the wear and tear on your clothes, which saves you money in replacement costs and helps your favorite shirt stay nice longer. I don’t always line dry year round, but after a long break it’s so nice to get back to line drying the clothes outside. There are times when it’s nice to have an electric dryer (overwhelmed with pregnancy and baby in my case!) but line drying is so much nicer and cheaper! It’s like an excuse to go stand in the sun AND be productive AND frugal all at the same time. Yay for multitasking! There are a few tricks to line drying that can help reduce wrinkles, speed drying time, and even avoid that crunchy feeling that can sometimes happen. Put your clothespins on the shoulder seams of dress shirts to avoid creating wrinkles. Hang t-shirts upside down to avoid a funny bump on the shoulder. And if you really enjoy the savings of line drying your clothes, you can even do it year round! 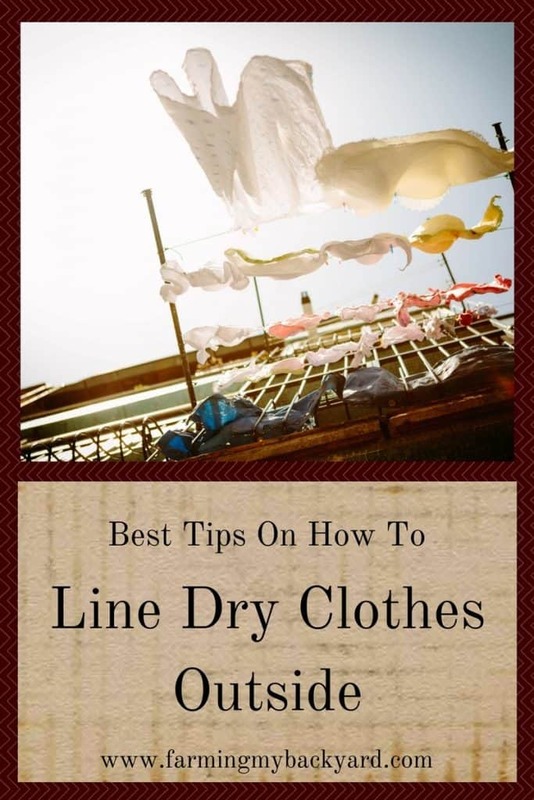 Check out my post How To Line Dry Clothes Indoors When Your Dryer Is Being Stupid for tips on line drying your clothes in less than ideal weather. I love it that in the book #Laundry by Angi Schneider that when the AC comes on, the dryer goes off. It’s such a good way to remember to incorporate line drying into the routine. (I got a free copy of the book to review, which was cool ’cause I like laundry)! Sometimes I get so excited about something that I keep trying to do it even when it’s not practical. It’s nice to give myself permission to slack off for a while, but then also be happy when I pick back up again. Line drying clothes is really pleasant when the kids are running around playing on the grass in the sun. It’s not so fun when it might rain any second and you really need some dry socks. Balance, balance, balancee. I am a confirmed fan of air-drying laundry. I haven’t even owned a dryer for 20 1/2 yrs. I dry everything outdoors more than half the year. During the cold months, I hang it indoors in a variety of ways. We have a suspended ceiling in one of our extra bedrooms. I put shirts, sweatshirts, pj’s, etc on plastic hangers that have a swivel hook…I have a few of those hangers which have clips..those are ideal for hanging jeans, bath towels, etc. I hang the hangers from the frames of the suspended ceiling & on an over-the-door hanger holder. I can hang sheets from the clip hangers or over railing by stairs. I also have a multi-line X rack which I hang all the socks, underwear, wash clothes, etc. I use clothespins so everything can hang down from the lines & dry quicker. Everything lasts longer than if I used a dryer & I can leave laundry hanging until I have time to put it away. No rushing to a dryer to get it out so it won’t wrinkle.